You never know where you’ll find a memoir! I stumbled across the Arab Film Festival in San Jose, CA this evening. What a treat! I love independent films as it seems the people who make them have something meaningful to share or say whereas the Hollywood-types just want to entertain. I went to see “Papa Hedi – The Search for My Grandfather.” Hedi Jouini (1909-1990) was a famous musician from Tunisia. He wrote more than 1000 songs (whoa!) and his music was (and still is) adored by his countrymen. The filmmaker, Claire Belhassine, was in her 20s when she was riding in a taxi in Paris, France. The music on radio was Hedi Jouini and the cab driver described the singer as the “Frank Sinatra of Tunisia.” Belhassine discovered that the singer was none other than her paternal grandfather. She had met him, but never knew about his singing career. Her father had immigrated to the UK and married a British woman. Claire Belhassine had been raised in the UK, and had a limited connection to her father’s roots in Tunisia despite a large extended Tunisian family. The film portrays Belhassine’s journey to discover her grandfather. He was already a successful musician when he met Belhassine’s grandmother. However, the woman Jouini loved, was not only Jewish, but 22yrs younger than he. Neither family approved of marriage, although the couple built a life together and had 3 (?) children. The couple lived quite modestly, without any recognition of Jouini’s success or fame. It’s unclear whether they were ever formally married. Jouini’s musical career sky-rocketed as he was a prolific song-writer, oud player, singer, and film star. The demands of his career often took him away from his family for as much as 6mos at a time. His children felt very detached from their father with the oldest admitting in the film that he was upset that his mother was alone so much of the time. The youngest son was treated more affectionately, perhaps connecting with his father through their common interest in music. Belhassine senses tension in the family and suggests in the film that her father, aunt, and uncles, all struggled with their identify as children of an Arab/Jewish union, as well as the absenteeism of their father. One son had confronted his father on the subject of Jouini’s affection for the family, but Jouini responds that he worked so hard, albeit away from them, to provide for the family. The son accepts the answer, although it’s obvious that he wishes his father had been more present in the family’s life. 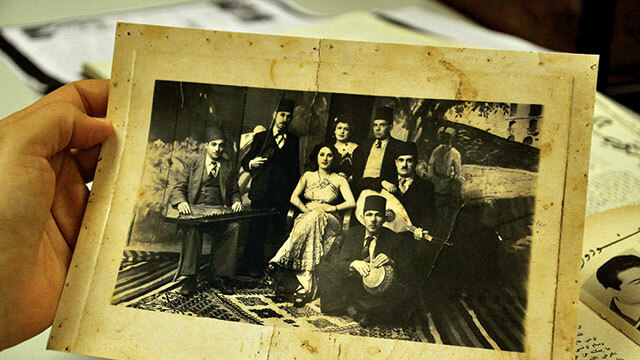 Belhassine’ father, and aunts and uncles, share her journey of discovery in the film. They look at the influence of Jouini in their lives more objectively, and consequently begin to understand themselves. They had always loved Jouini’s music. Through Belhassine’s work, they also come to love his memory. Belhassine could have written a biography about her grandfather, but instead she made a film that was a memoir distinctly her own. Bravo!